Solar Heating Panels absorb the energy from the sun and transfer this heat to water. 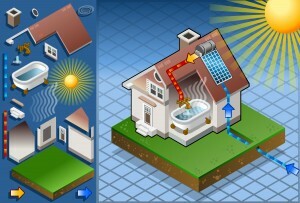 Hot water is then used either for heating your house or used for washing, bathing or showering. 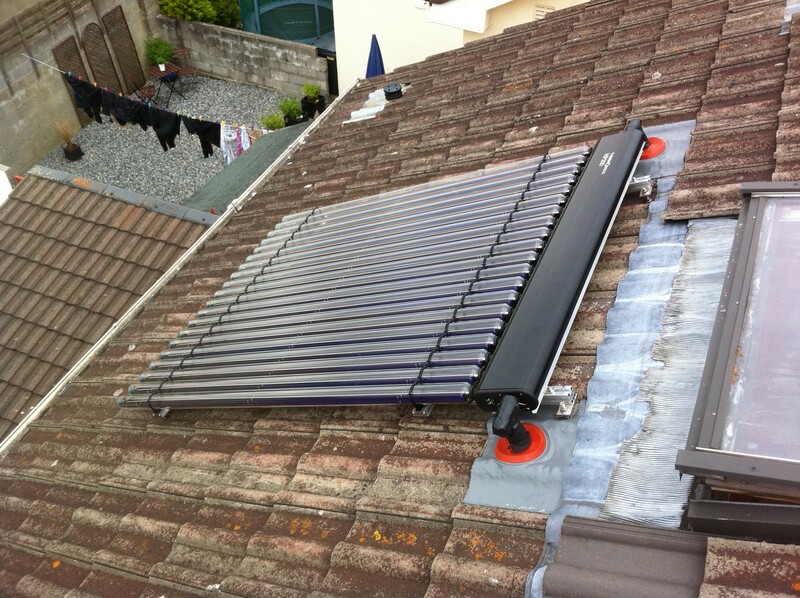 Modern Solar Heating Systems will provide plenty of hot water even on a dull summer’s day or bright winter’s day. Although there will be more hot water than you need on a sunny summers day and possibly not quite enough on a really dull day, a properly set up solar hot water system can provide 70% of your hot water needs. Solar energy is free, clean and safe . It is environmentally friendly and produces no waste or pollution. Using solar energy is very effective at reducing your carbon footprint as well as your energy bills. The sun radiates enormous amounts of energy to the earth, and as Ireland, on average receives only 60% of the solar energy that is received on the equator, a modest collector is sufficient to provide for all the heating needs of the average household. Evacuated Tube Collectors are more popular in Ireland because they generally take up less roof space and perform marginally better than PV Panels in prolonged overcast conditions. Watertech offers installation of Evacuated Tube Solar Panels. We also supply the panels, water cylinders and all other required parts and accessories. According to Bloomberg New Energy Finance estimates, the price of PV modules per MW has fallen by more than 60% since the summer of 2008, making solar power a viable alternative to traditionally generated electricity. Modern solar panels work very well not only in sunny countries but also in overcast areas like Ireland. They are a great solution to ever-increasing energy costs. Grant applications for Solar water heating now come under the Better Energy scheme from SEAI and are open for applications as of the 16/05/11. There is only one rate of payment which is now a flat rate of €800 per installation no matter what size. 3. The cost of the fossil fuel energy supply in the future. SEAI have a handy solar power payback calculator which can give you an idea of the possible benefit and payback a solar panel heating system can provide to your household. We are approved distributors of Kingspan Solar, a well-proven solar powered water-heating systems. If you would like to receive a quotation for installation of solar panels at your home, please contact us.